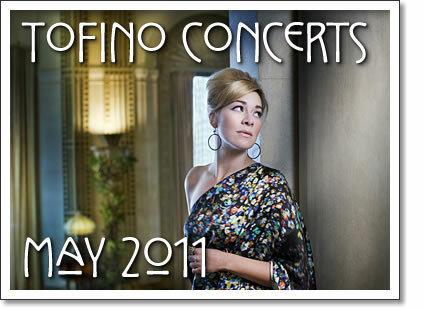 The following concerts in Tofino are happening in the month of May 2011. Tickets for shows at the Tofino Legion are available at Tofitian and Long Beach Surfshop in Tofino. Tickets for events at the Maquinna Pub are available at the door. For 12 years now Columbia’s Skampida has been blasting out their inventive and cutting edge sound, filled with horn driven ska reggea vibes, deep emotion and conviction that penetrates their listeners deep inside their soul and makes them evaluate life as a whole. Skampida have become one of the most successful and popular group’s to emerge from Colombia. They are exceptional in their style and in their interpretation of the Rock-Ska Genre, which is now so ever popular in the South American Continent. Their concerts are spectacular and their fans wait through rain, sun, and cold weathers to hear them play. They have performed with Manu Chao, and Gogol Bordello. Drawing on influences from old-time jazz standards, folk balladry and traditional country, Halifax’s Jill Barber has become one of Canada’s most distinctive young voices. Striking a balance between classic and contemporary songwriting styles Jill demonstrates a melodic sense, clever and compelling lyrical abilities, and showcases her unique voice, aptly described as a “cozy alto purr.” There is sense of timelessness to Barber’s songs, and a sensual quality to her performances. The National Post called her “Canada’s best alt-cabaret singer”, and she got four-star reviews in Eye, Now, and chatattack.com. She was also nominated for two 2005 East Coast Music Awards in the categories of Best Female Artist and Best Folk Recording and garnered a nomination at the inaugural Canadian Folk Music Awards, in the category of Best New/Emerging Artist. Tim Hus has a voice sweeter than a Husqvarna chainsaw, a wit that is sharper than rusty barbed wire, and a list of songs longer than a Saskatchewan fence line! Following his acclaimed CD Bush Pilot Buckaroo comes the highly anticipated fifth album (his 2nd for Stony Plain Records) Hockeytown joining Corb Lund and the legendary Ian Tyson on the label. Hus comes at his audience like a runaway rig, while firing off image-laden lyrics with the intensity of a western gunslinger. Jets Overhead has mesmerized crowds at home and abroad with their hypnotic take on ambient rock. Having toured the world in support of their last album, no nations, including seminal international festivals such as Coachella, Sasquatch, Bonnaroo and the World Expo in Shanghai, the band is now returning home for a series of exclusive shows on Vancouver Island. Jets Overhead was nominated for a Juno Award for New Group of the Year and is now signed to Neil Young’s Vapor Records. The USS sound is a mixture of drum and bass beats, grunge-like guitar riffs and 2-step rhythms. “We like to call what we do the campfire after-party,” Ash said, “It’s like you’re at Nirvana Unplugged but there’s a drum and bass party and glow sticks all around you.” Pure intention is the scope they aim through, eliciting dance-floor eruptions is what they’re known for. Science rap on breakbeat tracks anyone? USS have been In 2008, the band maimed mainstage at 102.1 The Edge’s Edgefest alongside Sam Roberts, Linkin Park and Stone Temple Pilots. Next was the World Electronic Music Festival, playing alongside drum n’ bass pioneers Andy C., Mickey Finn and DJ SS. Tofino concert listings from Tofino Time Magazine. Shows at the Tofino Legion and other music events in Tofino in May 2011.